I’m not sure this qualifies as a quiet room, but let’s talk about inequality anyway. More specifically, let’s discuss the taxes that some of the super-rich pay. The much-anticipated release of Mitt Romney’s tax returns confirmed what was widely assumed: He pays less of his income in taxes—13.9 percent to be exact—than do many middle-class households. Romney manages this sweetheart rate thanks to the so-called carried interest loophole that rather absurdly lets him classify the vast majority of his income as capital gains—which are taxed far lower than ordinary income. It’s an outrage. And one that is demonstrably without any justification. First, a quick primer on how carried interest works. Capital gains generally only apply to profits investors earn from risking their own capital. This is not so with carried interest. Indeed, the magic of carried interest is that some financiers book capital gains far in excess of any capital they ante up—or, put differently, they get to count performance fees as capital gains. This is an enormous boon due to the low taxation of capital gains. After equaling the top marginal rate of 28 percent at the end of the Reagan years, the capital gains rate has fallen to 15 percent over the past two decades (versus a top marginal rate now of 35 percent). This is why the über-wealthy—the top 0.1% earn half of all capital gains—have had their effective tax rate plummet over this period. This lower rate is usually justified due to the double taxation of capital from corporate income taxes, but this isn’t necessarily true. It’s well-known that many corporations pay little or no income tax, and there are certain corporate structures called “pass-throughs” that avoid all tax as well. 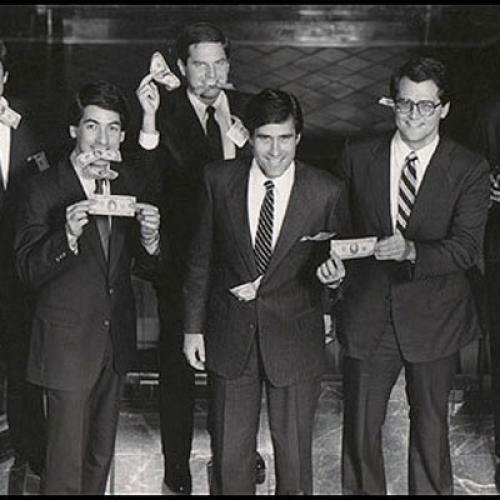 Private equity funds like Romney’s Bain Capital are, of course, organized as pass-throughs. Leave aside for now the debate over whether it makes sense, to begin with, to tax capital gains at a lower rate than other income. What can’t be denied is that the carried interest loophole allows Romney (and many other wealthy Americans) to apply the capital gains rate to something different altogether: ordinary income, specifically the profits owed to the members of private partnerships—think venture capitalists, along with private equity, hedge fund, and real estate trust managers. These financiers are customarily compensated along a two-and-20 model: they earn a management fee equal to two percent of the size of their fund, and a performance fee of 20 percent of any profits. The two percent management fee is taxed as ordinary income—i.e., 35 percent—but, due to carried interest, the 20 percent performance fee is taxed at the long-term capital gains rate of 15 percent, despite the fact that fund managers typically only contribute a small fraction of the capital at risk. In Romney’s case, he’s earning the vast majority of his money from a retirement package that entitles him to a continued share of Bain Capital’s profits. Courtesy of this cushy pension, Romney received $27 million in 2010 alone. The good news, though, didn’t stop there for Romney. Because Bain Capital is a private equity fund, Romney was eligible for carried interest. So while any other pensioner would be stuck paying a 35 percent tax rate on such a generous package, Romney was able to knock his tax bill down to 15 percent. Even his own economic advisor Greg Mankiw, a professor of economics at Harvard University, doesn’t think this makes any sense. As Mankiw points out, plenty of other professions involve working hard for an uncertain, but potentially lucrative return—such as textbook writers, like Mankiw himself. It’s difficult to dream up a rationale for why the tax code should so privilege financiers. Apologists for carried interest—they do exist!—insist that eliminating this loophole would cripple investment. Much hand-waving ensues. So too do invocations of “job creators” and admonitions against disincentivizing risk-taking. These free market bromides are, to put it politely, little more than fairy tales. Indeed, it’s hard to figure how ending carried interest would harm investment when doing so wouldn’t increase investors’ tax bills. Only fund managers would owe more to Uncle Sam. Of course, financiers might jack up their fees to try to recoup their lost income, but the threat of investors parking their money elsewhere should hold this in check. Even less convincing, though, are the claims that taxing fund managers like everybody else is taxed would curb their activities or make it harder for them to recruit talent. This is just empirically untrue. Consider the case of high-frequency trading (HFT) hedge funds. These automated traders aren’t eligible for the long-term capital gains rate (and hence the carried interest loophole) due to their gains not being, well, long-term. A position has to be held for a year to count as a long-term capital gain, otherwise it is taxed as ordinary income. There is, of course, an exception: gains from certain futures and options are taxed 60 percent as a long-term capital gain and 40 percent as ordinary income, regardless of their duration. None of this is an issue for venture capitalists and private equity managers who make multi-year investments, but it does impact the HFT crowd who make lightning-quick trades. Consequently, HFT hedge funds are taxed between 23 and 35 percent, depending on their portfolios. If there have been stories about HFT hedge funds having trouble hiring due to prospective employees worrying about their tax statuses, I have certainly missed them. This type of favoritism in the tax code is precisely what Republicans say they despise. Indeed, imagine the outcry from the Wall Street Journal editorial pages if President Obama proposed halving the taxes of teachers, lawyers or—gasp!— manufacturing workers. There would be shrieks about crony capitalism. And yet, when it comes to implicitly subsidizing financiers, the Republican establishment suddenly sees things differently. They shouldn’t. The proliferation of HFT hedge funds, despite being taxed higher, shows that the warnings of economic calamity if carried interest is eliminated are ill-founded. It’s well past due to close this loophole and make the game a little less rigged.